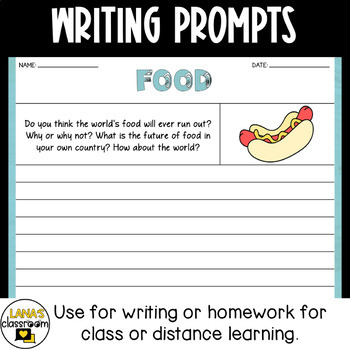 This ESL activity includes 40 Conversation Cards about Food and Eating to be used when practicing speaking with your students. 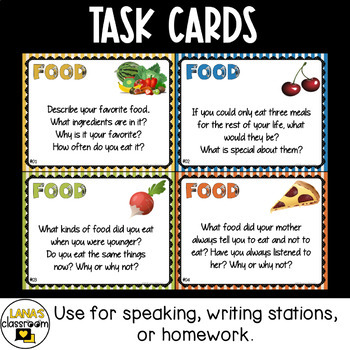 These conversation cards can be used in ESL lessons to practice speaking, in ELA classes as class openers or finishers or when introducing topics related to food and eating. Most of the cards can be used as writing prompts as well. The topics covered are more suitable with middle and high school students (please, check previews to see the type of questions). The product includes two versions of conversation cards: one for printing and one for overhead projectors. In this way, the product is much more versatile. You can choose to print the cards out and laminate them. You can also save paper and project the questions on the screen. In this way, you can make students discuss the same cards in pairs or small groups, use as writing prompt or even as a bell ringer. 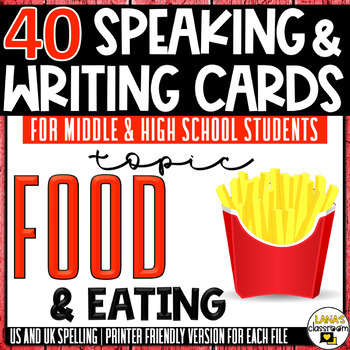 The options with these conversation cards about food and eating are limitless! You can find more products like this one, click below. ☞☞☞ Please leave a FEEDBACK not only to earn ✿✿✿ TPT CREDITS ✿✿✿ for further purchases but also to help me improve my products!